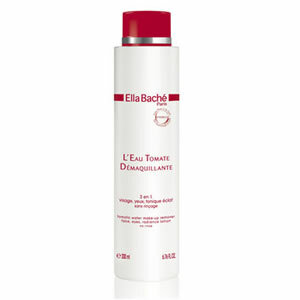 Tomato Water is a completely clear cleansing care with a unique powdered tomato fragrance. This extraordinarily effective all-in-one product dissolves away make-up and restores your skin to maximum radiance in just one step. Thanks to ProBioSkin, an exclusive NUTRIDERMOLOGIE ingredient containing pre- and probiotics, it protects the skin's natural flora and maintains a fresh complexion. For a final beauty touch, it nourishes your skin with tomato lycopene, vitamins and mineral salts which give it tone, radiance and keep it looking young.